Over the years he allowed his playful, poetical and nature-loving side to come to the fore with increasing frequency, for example in Come io passo l’estate (1983), a suite for "beginners" (gently recalling Schumann's Kinderszenen or Bartók's Mikrokosmos), or in his Sonatina (1984). While his preference for a dogged, solidifying insistence on one chord is particularly marked in He (1990) or Preludio, corale e fuga (1994), his partiality to the higher registers of the piano is evident in nearly all his works: "By an association of ideas, the high register recalls cold, ice and snow, elements that are part of Castiglioni's poetical imagination. The cold, though, has nothing hostile about it; it is healthy and beneficial, conveying the charms of a winter landscape and the beauty of that which is pure." 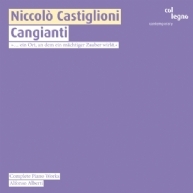 (Alfonso Alberti) And this stunning effect is not least owed to the interpretational tour de force undertaken by the Italian pianist Alfonso Alberti with a virtuosity that matches his devotion, assembling the complete piano works by Castiglioni on one album for the first time. In the echo chambers of tradition. Ernst von Siemens composer’s award winner David Pilip Hefti. The Canarian Folía as the core of the Sinfonia n° 1 "Canarias," an archaic Tocata, and an excursion into fiery Spain: Los elementos: n° 4 El fuego!